The first ever U.S.-Africa Leaders Summit, which will mark the first time an American president-Obama will convene Africa’s leaders at one conference in Washington; more than 50 African heads of state and government will gather this weekend for an unprecedented meeting in Washington that holds the prospect of reframing the Africa’s image, from one defined by conflict and disease to one ripe with economic promise of this century 21. While General Rodriguez of Africom is using military-to-military engagements, programs, exercises and other operations to respond to crises and deter threats, he emphasized that these efforts are geared toward enabling African partners to handle these problems. “We believe efforts to meet security challenges in Africa are best led and conducted by African partners,” he said, efforts that ultimately will depend on African nations developing effective partner-nation security institutions that respect civilian authority. On 12 October 2011, President Barack Obama announced that he had authorized the deployment of combat-equipped US forces, said to be primarily US special operations forces personnel to Africa. Special Operations Command, Africa (SOCAFRICA) is US Africa Command’s (AFRICOM) Theater Special Operations Command, a functional, sub-unified special operations command for Africa. SOCAFRICA contributes to AFRICOM’s mission through the application of the full spectrum of Special Operations Forces capabilities including civil affairs, information operations, theater security cooperation, crisis response, and campaign planning. SOCAFRICA exercises operational control of Special Operations Forces within the command’s area of responsibility in Africa, which included 53 countries and more than 13 million square miles as of 2010. On 19 December 2011 Agence France-Presse reported that US special forces had set up a base in the Central African Republic as part of their regional hunt for fighters from the Ugandan-born Lord’s Resistance Army group. “The deployment of this contingent, the size of which is unknown, was carried out very discreetly with Ugandan military aircraft,” a Central African military official said on condition of anonymity. The US troops set up a base in Obo and were expected to coordinate their efforts with local government forces and Ugandan soldiers. Besides Obo, the US forces also have a forward base in South Sudan. They began deploying to Uganda in early December 2011. The Washington Post reported 21 September 2011 that the U.S. was building a new military installation to host the unmanned aircraft in Ethiopia, where drones can more easily attack members of the militant group al-Shabab that is fighting for control of neighboring Somalia. The United States is reported to be expanding a secret drone program in east Africa and the Arabian peninsula in order to gather intelligence and strike al-Qaida-linked militants in Somalia and Yemen. The report also said the U.S. has re-opened a drone base in the Seychelles, an island nation in the Indian Ocean, where a small fleet of “hunter-killer” drones resumed operations this month after a test mission determined that aircraft based there could patrol Somalia. American Military Bases in Africa, 2012In May 2008 the United States Department of Defense said eight African countries were “very interested” in hosting the U.S. military command for the continent, known as AFRICOM. But there’s sustained resistance from the media and civil society groups in Africa to an increased U.S. military presence. Professor Gerrie Swart, political science lecturer at the University of South Africa, says “much confusion, suspicion and mistrust” continue to characterize the continent’s reaction to AFRICOM. “We’ve had a lot of jargon that’s been bantered about. AFRICOM could be seen as a means of presenting a more approachable, humanitarian side to the U.S. military, but that has not been clearly relayed to the African continent; hence the current apprehension that exists,” explains Swar. According to Swart, Africans don’t trust U.S. officials when they deny that AFRICOM is a precursor to steadily increasing numbers of American troops on the continent and U.S. “interference” in African foreign and domestic policy. Ezekiel Pajibo, the former head of Liberia’s Center for Democratic Empowerment and a strong critic of AFRICOM, convinced that the true drivers of AFRICOM are America’s growing need for African oil, Washington’s desire for a “new front” on which to combat terrorism and the U.S.’s wish to negate China’s increasing influence in Africa. “America’s chief interests are stopping terrorism and gaining access to African oil. Africa’s main interest at this point in time is reducing poverty and underdevelopment. They are not the same. How do they coincide? They do not,” Pajibo emphasizes. 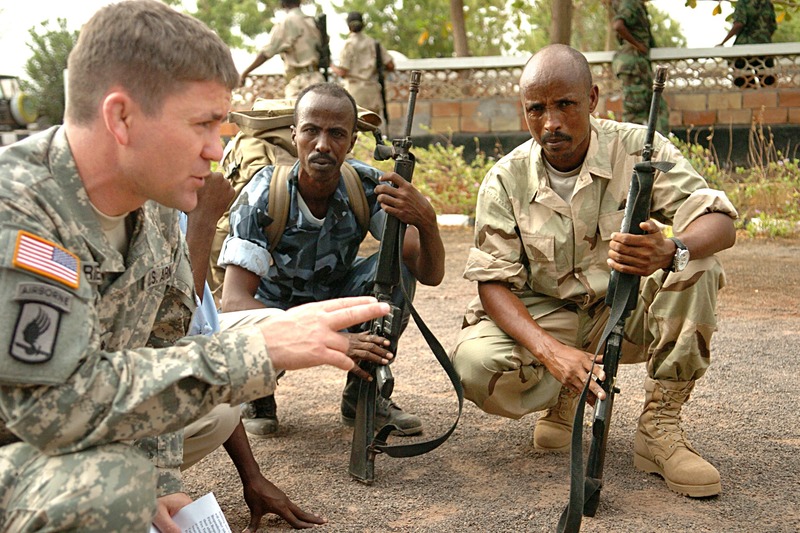 Initially AFRICOM did not intend to place masses of troops on the continent but instead focused on continuing the missions that it has inherited from EUCOM and CENTCOM, while doing no harm. President George W. Bush said 20 February 2008 that the United States does not seek military bases in Africa and is not a fierce competitor with China on the African continent. The purpose of U.S. Africa Command is to help leaders provide African solutions for African problems, Bush said in Accra, Ghana, during a joint news conference with Ghana’s President John Kufuor. Bush also stressed that the United States does not seek bases in Africa but may eventually seek administrative offices. Djibouti stands out as an ideal staging point for future U.S. operations. 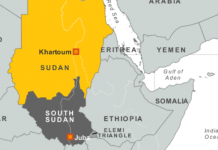 The U.S. has had military presence in the Horn of Africa in the past. These consisted of radio intercept and relay stations in Ethiopia, as well as humanitarian relief during the 1984-85 famine in Ethiopia, as well as operations in Somalia. Later the U.S. had two primary organizations operating in the Horn; Operation Enduring Freedom-Trans Sahara (OEF-TS) and Combined Joint Taskforce-Horn of Africa (CTF-HOA), the latrer stationed in a former French Foreign Legion base in the tiny Red Sea state of Djibouti. In addition to Camp Lemonier, by 2007 three permanent contingency operating locations were up and running, two in Ethiopia (Bilate and Hurso) and one in Kenya (Manda Bay). A fourth base was established in 2005 or 2006o in Gode, Ethiopia, but it was closed as events heated up in Somalia. As early as 2005 it was reported that American troops were deployed to Lamu, Kenya, as part of the 1,500-strong Combined Joint Task Force Horn of Africa. With the Somali border with about 100 kilometers north of Lamu, US officials were eager to accept Kenya’s invitation to bolster their sea and land defenses. At times American troops marched in full combat gear through Lamu’s narrow lanes in a show of force. The coastal town of Lamu is frequently the site of large joint Kenyan-US military exercises. The US has built a military air base at Manda Bay in Kenya. US troops are stationed inside Camp Simba, a Kenyan naval base located on that country’s sandy coast. The US is building drone bases in locales throughout Africa. A report from the Washington Post on 20 September 2011 revealed that the United States is expanding its controversial drone program into Africa, building bases throughout the continent in order to run unmanned planes over al-Qaeda territories in the ongoing War on Terror. In the Post’s report, an unnamed source close to the operation confirmed that the CIA is currently working on a secret base in the Arabian Peninsula in order to send more spy planes into Yemen. Bases were also said to be either in operation or under construction in Ethiopia, and another on the island of Victoria in the Indian Ocean archipelago nation of Seychelles in operation since September 2008. Both Seychelles and the United States had acknowledged the base in the past, but reported then that it was only there to track area pirate operations. The officials cited in the Post report, however, say that the increase in drone operations is being used to target al-Qaeda affiliates in Somalia and Yemen, as the US builds up its drone bases despite continuing criticism of the competency of the spy planes. In December 2010 Intelligence Online, a Paris Web site that specializes in global intelligence, reported that the US Army Corps of Engineers was seeking “expressions of interest” in building a military airbase in a “North African country,” indicating the Americans may be planning to take a more active role in the regional war against al-Qaida. The request was issued 02 December 2010, but did not specify which country the Pentagon might have in mind. The report stressed that “the project is lacking both authorization and funding at the moment, and there’s nothing to say that (the airbase) will ever be built.” U.S. military planners had been interested in establishing an airbase at Algeria’s Tamanrasset facility in the Sahara Desert. According to the BBC, as of 2007 the US was building a naval base in Sao Tome and Principe to protect its oil interests. In October 2011 President Obama said he was sending 100 American troops to Uganda to help and advise forces fighting the Lord’s Resistance Army. One article in 2007 reported that “Despite Ghanaian Defence Ministry officials debunking the claim that Washington is not building military base in Ghana, some Ghanaians, with their high conspiracy theory syndrome, belief that there is a US military base and that the US has built a secret tunnel from the new US Embassy complex to the Kotoka International Airport in Accra…. According to the Nigerian Prof. Toyin Falola, Professor of history at the University of Texas in Austin, USA, today, the United States has over 175 military bases in Africa…” globalsecurity & Geeska Afrika Online security archives. Africa seems stuck in it’s post-colonial malaise and like China in 1984, wanting everything from the USA and wanting to give the least amount in return.